This is a sponsored review brought to you by AVASIA Prenatal Vitamins. All opinions are my own. When should you start taking a prenatal? You should start taking them before you are pregnant, like when you are trying to conceive. But if this isn't an option, start taking them as soon as you find out you are pregnant. The folic acid element is particularly important at this stage and in your first trimester. Why take a prenatal vitamin and not just a regular multivitamin? Prenatals contain more folic acid and more iron than a normal multivitamin. These increased levels are really important because Folic Acid helps prevent neural tube defects which are serious abnormalities of the brain and spinal cord. Iron supports the baby's growth and development and helps prevent anemia. 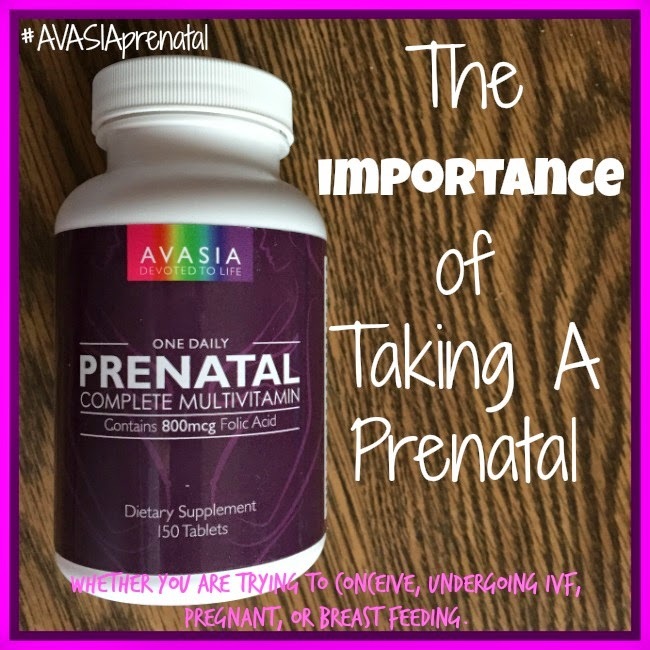 AVASIA Prenatal Vitamins are specifically designed by their Advisory Board of Doctors and Scientists to ensure you have the best combination of vitamins and minerals you will need. But why should I keep taking one when I'm breastfeeding? Because your baby keeps receiving those benefits through your milk. And you want to ensure that your milk is of the highest quality. I love that for around $30 you can get a 150 day supply. 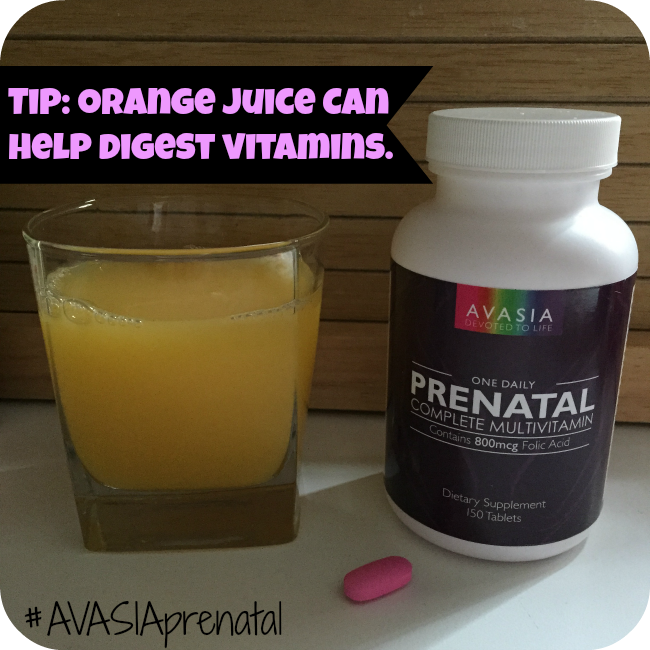 The great thing about AVASIA prenatal vitamins is you only need one tablet a day and it's both gentle on your stomach, and easy to keep down. I am not pregnant, so whether or they would cause me to be nausea then, I have no clue. But sometimes prenatal vitamins can even if you aren't pregnant (at least this has been my experience), but these were very easy on my stomach even though they are a little larger than my previous prenatal vitamin. They're a vegetarian prenatal and they pack a lot of nutrients. They contain no gelatin and have twice the Folic Acid plus all the Iron you need in pregnancy. They also have all the Recommended Dietary Allowances for the other major vitamins and minerals you would expect (except calcium, which is deliberate because that inhibits the absorption of iron). I just drink it with a glass of calcium rich orange juice. Orange juice helps your vitamins break down faster. AVASIA's manufacturing facilities in the USA have more independent certifications for cGMP (Current Good Manufacturing Practice regulations enforced by the US Food and Drug Administration) compliance than any other in this market. Whether you are trying to conceive, undergoing IVF, already pregnant, or breast feeding, with AVASIA Prenatal Vitamins you'll experience all the benefits that taking a top quality Prenatal Vitamin can give you. I received complimentary products and compensation to share this post. All opinions are my own. I loved taking prenatals. My hair and nails were fab! I've heard you can take them even if you aren't prego and it will help with hair/nails and skin. Great review! I had no idea that orange juice can help you digest vitamins. That's awesome. I think that $30 for a 150 day supply is an incredible deal! Thank you for sharing. Your picture is cute too! I took prenatal for almost 4 years straight. Started when we started trying to conceive my first daughter then all the way until my second weaned. This is a great deal! And thanks for the OJ tip! I take prenatals sometimes for the iron especially if I am having bouts of vertigo. They seem to help. I wish I had known about the OJ tip years ago!! Great information. It is definitely important to take during pregnancy. This is a great price for the quantity! If and when Adam and I have our first child, I am 2000% sure I will be taking prenatal vitamins. I have heard that they are incredibly important all my life from all of the women around me who are family planning, and I know that I already have an iron deficiency so this will be key if we ever have kids! I take prenatals as a multi after it was suggested by my ob-gyn and I found that they have a nice side effect of improving my hair, skin and nails. Yay! I'm so glad you did a post on this! I did one recently as well and completely agree with how important it is to take prenatals! Thanks for the tips!... Yes that true Prenatal Vitamins are really helpful at times of pregnancy. Get the right one so that it doesn't bring any complication to your pregnancy... Take care... Thanks.